PHOTO BY PAT GAIETTO Clyde’s Seth Hohman and Bellevue’s Dakota McPeak go for a rebound Tuesday in Willard. WILLARD — Usually a team looks to its seniors during tournament time to lead the team. 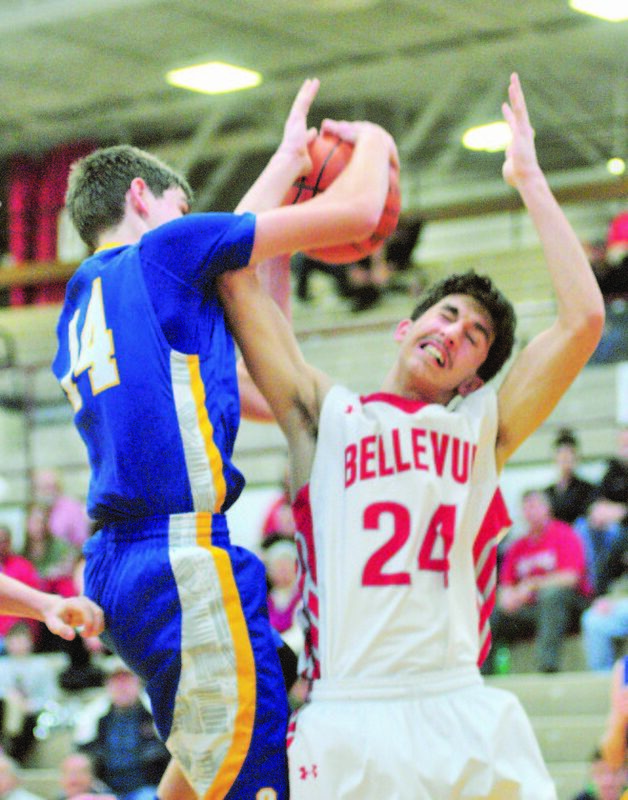 For Bellevue, it was sophomore guard Trey Ruhlman who was the man in the second half against rival Clyde as the Redmen fended off a scrappy Fliers team for a 50-46 win in a Division II sectional semifinal Tuesday night. Ruhlman, who scored 15 of his game-high 24 points in the second half, had the ball in his hands almost every time down the floor for the Redmen and would either create for himself or his teammates. “(Ruhlman played) unbelievable considering that they threw everything they had at us defensively with a junk defense,” Bellevue coach Ed Rich said. “For them to throw that at him and for him to still get 24, that’s just a compliment to him. He plays extremely hard and he does some great things and has great reads and had the mentality that we weren’t losing. I love guys like that. Bellevue will face Sandusky for a third time this season in a sectional final at 8 p.m. Friday. Bellevue (10-13) led for most of the game, but its biggest lead was six at the beginning of the game and with 3:09 left. After Clyde (6-17) took a 35-33 lead into the fourth quarter, the Redmen took the lead right back with four points from Ruhlman to start the fourth period, which gave the Redmen a 37-35 advantage. Bellevue started to run strictly pick and roll at the top of the key with Ruhlman late, which led to a lot of success. It gained a 44-38 lead, but then Clyde’s Seth Hohman buried a 3-pointer. Ruhlman hit a pair of free throws and then Hohman drilled another triple and then Conner Long drove to the rim and banked in a floater to tie the game at 46 with 44.2 seconds left. On Bellevue’s possession, Ruhlman drove to the rim and was fouled. He knocked in the pair. Clyde had 26 seconds to even the score, but Trevor Burtch’s 3-pointer was wide of the rim. Kayden Vogle was fouled and put the game away at the line with a pair of free throws for the Redmen, who finished the game 13 of 14 at the line, including 11 of 12 in the fourth. Both teams were up and down the floor in the first half as they both had 11 turnovers in the half, and 18 overall in the game. “We didn’t fail to prepare, that’s for sure,” Clyde coach Ryan Fretz said. “We put a lot into this and got to see them a couple times before we played them and the boys were 100 percent focused the whole time. We knew that if Bellevue is on, they’re on. They came out and hit a couple of 3s, but I’m proud of our boys for stepping it up with our man-to-man defense and being able to get back in the game. Bellevue led 14-12 after one quarter and took a 23-18 lead into the half because of a 9-2 run to end the second quarter with five Ruhlman points and a pair of baskets from Vogel. Clyde came out ready to play in the second half and grabbed a 29-28 advantage on a Tanner Davenport trey. It extended its lead to 35-30 late in the third after a Burtch layup, but Ruhlman swished a deep 3 to end the third period. Sandusky has beaten the Redmen 69-42 and 74-47 this season. Personally for Rich, he will see Sandusky standout Jayrese Williams for a second time in the sectional finals. Vogel had 10 points for the Redmen, while Hartley added nine. Clyde was led by Hohman’s 14 points, while Derick Harrah chipped in 10 and Davenport finished with nine. For Fretz, it was a return to home this season as the Tiffin native enjoyed his first season as the Fliers coach after a stint in Las Vegas.